Vacation season is upon us. Before long, travelers will be packing their suitcases and heading to new destinations both at home and abroad. And what if you’ve decided to come to Iceland for your holidays? Depending on where you’re from, you might only have a few days for a break. Some people don’t even have time for a 7-day itinerary in Iceland! If this is your case, then don’t worry. There’s still plenty to see and lots of things to do if you’ve only got five days in Iceland. I’ve created this itinerary to enjoy even the shortest trip to our small, Nordic island. One suggestion I will make is that you don’t try to cram everything in. It’s pretty much impossible to travel around Iceland’s Ring Road in five days without feeling extremely rushed. Instead, let’s stick to the South Coast, the country’s most popular zone, during our 5-day Iceland itinerary. All international visitors fly into Iceland’s Keflavik airport, located a 40-drive from the country’s capital city. Once you’ve arrived at the Iceland airport and picked up your Iceland car rental, it’s time to explore the vibrant, Scandinavian city. There’s lots to see and do in Reykjavik, including Hallgrimskirkja Lutheran Church, Perlan Observatory, the Settlement Exhibition, the Saga Museum, the Sun Voyager Statue, the Whales of Iceland Exhibition, and Laugavegur street for both shopping and nightlife. Of course, there are plenty of other things to see and do like whale watching or visiting cafes and museums, but we’ve only got one day! The Golden Circle is one of the most popular tourist routes in Iceland and is an easy day trip. The 186 mile (300 km) circuit encompasses many sights in Southwest Iceland. 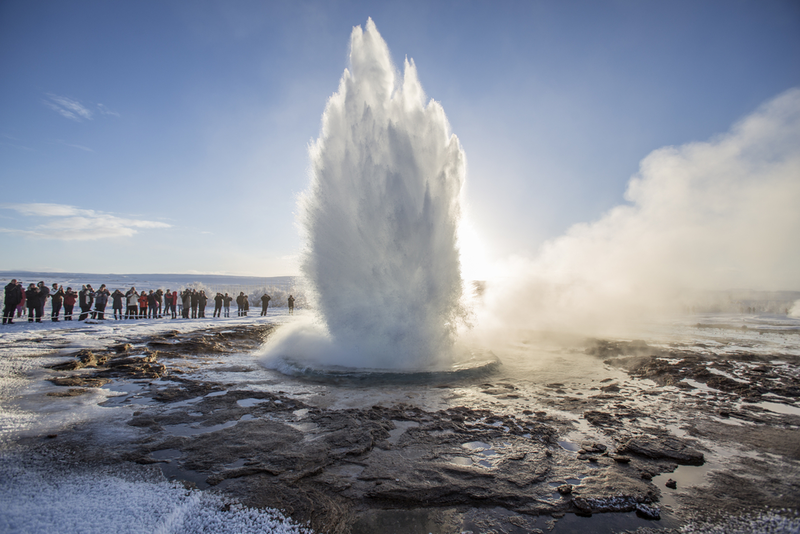 The “big three” on the Golden Circle route are Thingvellir National Park (home to the Silfra Fissure and Iceland’s original parliament), the geysers Strokkur and Geysir in the Haukadalur geothermal area, and Gullfoss waterfall. There are several other stops along the route and if you make it a loop, feel free to stop by some other attractions on the Golden Circle route. Day three of our 5-day Iceland itinerary sees us leaving Reykjavik and heading east on the Ring Road along the South Coast. On the way to Vik, you’ll want to make two stops just off the main highway. The first is Seljalandsfoss, also known as the most beautiful waterfall in Iceland. Be sure to crawl behind the waterfall’s cave to get the best view. An optional next stop is Skógafoss waterfall. While not as famous for its beauty as Seljalandsfoss, Skógafoss is nevertheless also breathtaking to behold. Once you arrive in Vik you’ll want to visit the country’s famed black sand volcanic beaches and hexagonal basalt columns at Reynisfjara. Vik is a wonderful halfway point between Reykjavik and Vatnajökull National Park. It’s a small fishing village with a population of around 300, so you’ll find small guesthouses and quaint facilities for your overnight stay. Rest up for tomorrow, you’ve got a big day ahead. As Europe’s largest national park, Vatnajökull has several prominent areas that you don’t want to miss. Be sure to take a glacier hike or explore the ice caves and glacier caves in Skaftafell glacier or Vatnajökull glacier. Once you’ve done that, head across the road to Jökulsárlón glacier lagoon. After you’ve seen the floating icebergs, get up close and personal with the huge chunks of ice scattered across Diamond Beach. This is an adventure-filled day and one you won’t soon forget. It’s time to head back towards Reykjavik as you’ll soon have to catch your plane home. How time has flown! But before you print out those boarding passes, make a stop at the Blue Lagoon, Iceland’s most famous geothermal spa. There’s nothing like a soak in the naturally-heated, silica-infused waters to melt all of your troubles and stresses away. This is the perfect way to spend your last day in Iceland, so why not get a massage while you’re there? Just be sure to book your time slot and tickets in advance as the Blue Lagoon is in high demand with weary travelers. You don’t want to be left without a spot. Traveling along Iceland’s South Coast truly allows you to see the best of what the island has to offer. In a small, concentrated area you’ll discover many of the natural wonders that Iceland is so famous for. From the stunning Skógafoss and Seljalandsfoss waterfalls to the might Skaftafell and Vatnajökull glaciers to the volcanic black sand beaches of Vik, there’s lots to explore. Hopefully, your five days in Iceland has given you a small taste and next time you’ll come back for a longer road trip.